An easy chicken satay recipe served with a Thai inspired peanut sauce. The chicken is soaked in a coconut milk marinade before baking in the oven or grilling. Cooking the chicken: Thread chicken chunks onto the skewers, leaving about half of each skewer empty for handling. Place them in a single layer on a large baking sheet. Bake at 450 F for 10 minutes, flip the skewers, and then bake another 5 minutes or until cooked through. Alternatively, you can grill the chicken skewers. Making the sauce: While waiting for the chicken to cook, add all peanut sauce ingredients to a small saucepan. Whisk together over medium-low heat until smooth, a few minutes. Keep warm over low heat, stirring occasionally. Serving: Transfer chicken skewers onto a serving plate. Brush peanut sauce over the chicken. Top with sliced scallions and optionally black pepper. Serve while warm. 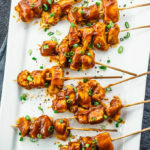 This recipe yields 3 g net carbs per serving (2-3 chicken skewers).